I really enjoy stories about journeys. This doesn’t necessarily mean physical journeys (though that doesn’t hurt), but any kind of journey really. And preferably a big one. The kind where when you finish, and think back to the beginning of the tale, you are surprised and breathless by how much has happened. 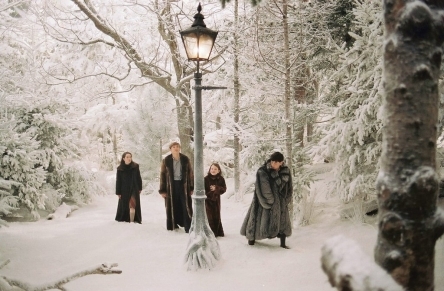 Stories like The Lion, The Witch, and The Wardrobe, where these kids literally spend years of their lives in another world, only to be catapulted back to their own world, and back to a time when only a few seconds have passed since they left. Stories like Harry Potter and the Philosopher’s Stone, where this boy begins as a regular kid in a %$#@^ situation, and ends going back to that same place as a wizard with magic, friends, and a crazy destiny. Stories like The Sisterhood of the Traveling Pants, where four girls start a summer bemoaning the fact that they will not be with each other the whole time, and end the summer each changed forever by the events that have passed. Stories in movie form, too, like The Goonies, where these kids start out sitting at a house, and end in a cave with a lagoon, a pirate ship, and a fortune of jewels. Movies like Body Double, which I cannot even begin to really explain but which takes one actor on a head-spinning mystery adventure involving lust, murder, and an unexpected way to confront a phobia. And even things like The Parent Trap, where two girls go to summer camp with no idea that what’s in store for them is a twin they never knew existed, and a switch that will show them a new life. Do you see the idea? Journeys can take many shapes, and not all stories have them. But I often enjoy the ones that do. What are some of your favourite journey stories? LOVE The Chronicles of Narnia and The Sisterhood of the Traveling pants. I love The Parent Trap to! Journeys are awesome. And the best part is when you're reading the book or watching the movie, you can get pulled in and it is like you are right there! I think all good stories are a journey in *some* way at least. I was glad to come across this post because I've been thinking about this kind of thing lately as I revise my WiP! I think all stories are journeys, but I do enjoy the true "road trip" type journeys very much, rather than just the emotional journey type of story. I LOVED all of the Sisterhood of the Traveling Pants books, but I refused to read book #5, which took place 10 years later when they were all adults, and Tibby–my favorite character of the four girls!!!! !–has died!. Like you, I'm a writer and a (former) children's librarian at a public library. Stopping by from the A-Z, and am your newest follower!